These tools and calculators are designed to help producers manage their ewe flock more effectively and make better management decisions about feed budgeting and grazing. Use them in conjunction with information on feed budgeting and grazing management. This tool can be used to estimate the supplementary feed requirements of a sheep enterprise for a single year. The calculator provides a broad estimate of the feed requirements for a single class of sheep as well as an average feed requirement on a monthly basis to maintain condition in adult sheep and grow weaners at a moderate rate. The tool gives outputs in either a graph or table format. This calculator was developed using the best available data for animal and pasture relationships for annual legume-based pastures. It should be used at the break of season and relies on an accurate assessment of feed on offer (FOO) and the current pasture growth rate of the pasture. The values for the animal requirements are taken from GrazFeed®. This tool can be used to work out the lowest cost of a number of different sheep feeds. It can also be used to work out the feed value of a chosen mix of feed in terms of its energy and protein value and provide a cost per tonne, per megajoule of energy and per kilogram of protein. Deferred grazing is a tactic where stock are excluded from pasture areas to maximise germination and establishment of pasture seedlings. Use this calculator to determine how many days it will take to meet a pasture target at a particular pasture growth rate. Strip grazing is a tactic used to increase FOO during winter and is a valuable management tactic for woolgrowers wanting to increase stocking rates, maintain stocking rates in poorer seasons or improve the quality of wool produced. This calculator allows you to determine the area of the strip within a paddock required for your sheep. Preventive chemical application is an important part of flystrike management in sheep. Both the flystrike chemical planner and the app allow you to view the main chemical groups and the relevant wool, local slaughter and export interval date for each chemical group. The flystrike assist app helps producers make decisions about the appropriate chemical for flystrike prevention while observing chemical withholding periods. Specifically designed for your smart phone, the app allows you to set an application date and prepares a timeline for that application. The app also allows you to record treatments for different mobs of sheep and sends you reminders when withholding and protection periods are completed. The lambing planner sets out key management operations that make up the breeding cycle, providing information on ewe and ram nutrition, condition score targets at different stages of reproduction and lambing guidelines. You can select a joining date, and from that point gain a series of guidelines and recommendations regarding the use of teasers, ram preparation, joining ratio, ewe feed requirements and the timing of worm egg counts (WEC) and lamb vaccinations. Condition scoring of sheep gives the producer an accurate picture of the mob's nutritional status which can be used to predict production of wool and lambs as well as general wellbeing. 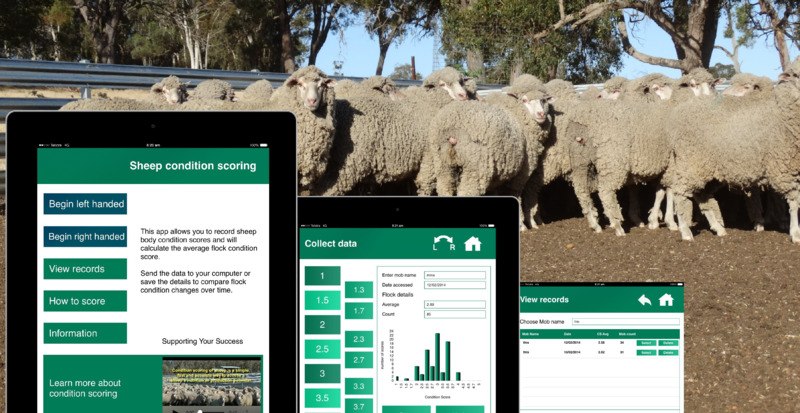 The sheep condition score app allows the user to record condition scores of a sheep flock and view the results instantaneously on the screen. The screen shows a histogram of the scores, a running tally and the average score of the mob. Users can choose to send the data via email to their computer or view results from past sessions. The app contains useful information on condition scoring and a video on the method used.